connected all the boards together, powered up and tested using my mobile phone. seems very sensitive! perhaps too much so. its a bit hard to tell without the acrylic. it seems like signals from one board start to affect other boards nearby and in the same row. also the board receiving the power seems to lit up more. currently building the table frame out of aluminum. needs to be reinforced. with luck will be done with construction this week! Most tables designed for writing or dining should be 28" to 30" high (29" is common) with chair seats 11" to 13" lower. The higher the tabletop, the more uncomfortable and formal the table feels. Provide about 24" of leg room below the table (height from floor to bottom of table rail) and at least 12" for knee clearance (projection of table top beyond table leg). on three of the boards, there was a problem: the bottom right coil seemed to be very insensitive. I think there was a cold connection with GND. i think while soldering I burnt the connection. I was able to correct one of them. I will see how to fix the other two tomorrow. I finished soldering all 15 circuit boards. before the boards arrived i also etched a tiny circuit to regulate to 5V. the indomitable Tom Jenkins is a chemistry wiz and whipped up some cupic chloride. it is fizzy green like some kind of green apple soda. it worked great, but you have to mix it fresh, is what we learned the hard way. now to start building the table! Table for Electronic Dreams reveals the invisible workings of electronic devices and the limits of human perception. April 17 - playtest, documentation. April 24 - final draft of paper. barebones circuit worked great! I built a prototype to see what it would start to look like with many sensor/LED pairs, figure out optimum distance of acrylic surface, etc. circuit boards due to arrive Monday from Goldphoenix. two videos, one of my cellphone receiving a call, another with iPhone. I forgot to take stills. Found a cheap(er) source for telephone coils. Ordered two to see if they worked, they work great! So I ordered 60. Actually the cheaper ones are better because the casing comes off very easily... I was struggling to remove the casing on the Radioshack telephone coil. Later the same day inductor coils from Electronic Goldmine arrived. I had forgotten about these! Haven't tested yet... but I have working coils.... should be worth testing anyway. designed a board using Eagle. Sent it to Barebones PCB to test. Due to arrive Tuesday. Hopefully it will work fine! I also ordered all the components from Digikey and white LEDs. I ordered so many things my credit card company called me to make sure I wasn't a victim of identity theft! 1/4 inch translucent white acrylic 33" x 21"
1/4 inch clear acrylic 33" x 21"
33" x 21" --> golden ratio! I am using white piranha LEDs. I experimented with different acrylics today. a translucent white from Canal Plastic created a very nice effect- the circuit was completely hidden and it diffused the light very well. The distance between the LED and acrylic makes a big difference in how big the halo is. I was also inspired by something I saw in the Taschen book Design for the 21st Century called the Tattoo Table, but I can't find it online [remember to look this up]. It was a glass table with some pattern etched in it, so that when light shone on it it projected those patterns onto the floor. I am thinking now the design of the table can be very simple. The circuits will be sandwiched between two sheets of acrylic. perhaps the bottom one could be clear. I talked to the indispensable Raphael Zollinger about construction details. He built furniture for a few years, and so his advice was invaluable. This is a part of the project I was very intimidated about, but he suggested a method which will be simple, elegant and easy to construct. I also went to Material Connexion on Tuesday, where they were very nice to me. I was really impressed with the privacy glass, which when you run current through becomes clear. There was also ink containing DNA, fluid which harden/softens in response to magnetic fields (is this ferrofluid? ), special polymers for LEDs, photochromic dyes which respond to UV light, screen printable electro-luminescent ink.... some of this I need to investigate further, just for my own curiosity. I will try to get samples of the printable electro-luminescent ink. I don't think I'll be using it at this point but there is always a possibility. Feedback - It turns out the LM324 doesn't have feedback issues. This is a relief in a way. Experimented by trying to create distortion by linking two op amps, but this didn't work. I mostly just got a steady light. But when I just had the single circuit working, I noticed it began blinking in weird ways at one point for no apparent reason. So perhaps there would be unintended effects. I got the impression from my midterm presentation that some people thought just a revealing of EM wasn't really exciting enough, but I think it may actually be very expressive. The cellphone blinks, and when it receives a call suddenly splashes out. Turning external harddrives on and off would excite more LEDs. I hope that it will actually show something about the functioning of the devices. The induction coil - the Radioshack telephone pickup retails at $8! it works great, but if I need 60 of them thats just too expensive. I ordered a few induction coils off Electronic Goldmine, hopefully there will be at least one which works great.But I have no idea. I need to find a good, cheap coil to use. I don't know why the excessive cost did not occur to me earlier. I guess I was just trying to get the damn circuit to work. Now I am seeing the entire design more or less together, which is good. I will also try hand-wrapping coils.... I should probably try this anyway, see how wire gauge, wrapping, etc. affect what frequencies are detected... there is still a lot about the induction process which is just a mystery. I am also trying to cut open the pickup to see what the inside coil looks like, so I can imitate it. A lot of my project seems to be involving trying to reverse-engineer Radioshack gear. Yesterday I presented my thesis idea in class. Even though I was nervous I felt like I got some great feedback from the guest critics. I was especially fortunate to have Usman Haque as a guest critic via Skype from London, although I made a mistake in misrepresenting one of his projects, which was pretty embarrassing. Electronic objects are not only “smart”, they “dream” – in the sense that they leak radiation into the space and objects surrounding them, including our bodies. Despite the images of control and efficiency conveyed through a beige visual language of intelligibility and smartness, electronic objects… are irrational – or at least allow their thoughts to wander. Thinking of them in terms of dreaminess rather than smartness opens them to more interesting interpretations. I had mentioned something about the necessity of self-shielding in order to prevent feedback from the sensor and amplifier circuit. Usman felt that this could actually be an interesting element, and once he pointed this out I found it very appealing. It could add an "irrational" element to the table. It has to do with the physical properties of the amplifier, even a misuse of circuitry. There are two ways which this could be introduced: (1) the sensor near the amplifier circuit could create feedback, or (2) it is possible by incorrectly configuring an amplifier circuit to create distortion or junk, or by attaching two amplifers in series. There needs to be a balance with the chaos though; too much chaos and it becomes meaningless. Just enough chaos to make it interesting. If it is an irrational table, another thing to consider is how it should look. Should it still be a standard, rectangular desk table? But the fact that it has electronics might make it strange enough without an odd shape. Considering the material, my brother suggested creating it with a somewhat soft surface, possibly something like silicone. This makes sense because (1) the table is for electronics... perhaps now you could drop you cellphone, laptop on it less gingerly than on a hard table, with less fear of damaging them. (2) with this metaphor from Dunne about how electronic devices "dream", the table could be their soft bed. My working title for the project is now Table for Electronic Dreams. I am a bit worried that there are only 7 weeks left in the semester! I think my next priority should be to finalize a circuit and create a small prototype, with 4-6 lights and start trying to figure out materials and construction details. Sort of my idea as a wearable. They seem to be using LED bar graph drivers... I hadn't thought of this, but I could have each coil attached to multiple LEDs, possibly for greater contrast in displaying field strength. I actually bought some of these from digikey for some reason, and I think I might try this out. 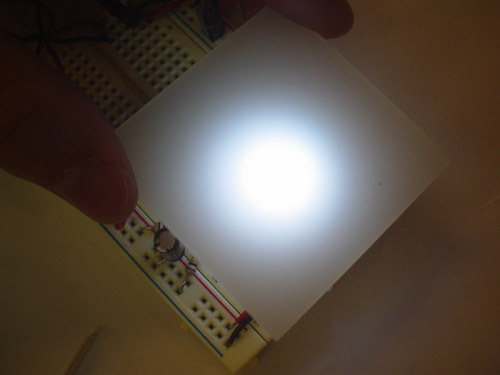 1,301 florescent tube lights under high power lines drawing powering wirelessly! I would like to be able to recapture some of the lost energy. I need to check how much AC voltage comes along the induction coil- it is probably not very much at all. But if I run it thorough a bridge rectifier, that would be a way to store some energy. This doesn't have much to do with my project directly, but I love it! Different hertzian frequencies imagined as Haeckel type organisms, with fake latin names. She made a beautiful old book with medical style drawings. Despina asked me to do some use studies of how people use tables. so i took some photographs around my apartment. laptop, wireless mouse, external harddrives, alarm clock, desk lamp, cellphone. When items are left on the table for more than a few minutes, the cloth starts to glow beneath them, creating a halo that expands over a period of days. When items are removed, the glow fades quickly. That’s all it does. The History Tablecloth makes visible a significant aspect of home life—the history and movement of objects on domestic surfaces, emphasized by ethnographers as an important resource for domestic coordination. Rather than bringing new content into the home, the History Tablecloth embodies a suggestion that domestic technologies may make powerful effects simply by pointing out the richness of existing phenomena. By visualizing an important aspect of the home, the Tablecloth is designed to provoke people to think about how they use their homes. The system doesn’t imply a value judgment about moving objects or leaving them still, however. People might be reminded to tidy up more often, but equally they might simply enjoy the patterns that emerge when things are left on the table over time. The Tablecloth doesn’t dictate peoples’ reactions or suggest what activities they might pursue. It isn’t for anything, and that’s the point. It simply creates a situation that is novel and potentially significant, and leaves people to find their own meaning within it. like sand, or snow. the table recoups a time when we lived in the jforests or deserts, our actions left marks which fade over time. diffuse light. light through frosted acrylic. it will need electricity, the table will need to be plugged into an AC outlet but this can be turned into an advantage, since with desks these days you want some outlets at the bottom anyway. I have decided after some discussions to build a table containing electronic sensor. The table surface will act as an informational display of recent exposure to electromagnetic radiation. The table solves the problem of needing very sensitive hanging sensors. It also seems more appealing, to create an industrial product rather than an installation. It is similar to Dunne & Raby's brilliant Compass Table. also Ingo Maurer's benches with LEDs, perhaps. I want to use magnetic pickups which convert EMF into AC voltage along audio cable (1/8"). I like the richness of the information, but I don't plan to have a table which creates sound- too distracting. I can take the sound however and use RC filtering to get high, medium, and low band filters. Using this information I can create colors based on the sound- e.g. mapping high, medium and low to red, green and blue values of the lights. Round table, 4 feet in diameter. Could buy a table and add electronics. I want the table to use analog circuitry but I may have to use a micro-controller. I want it to record electronic usage over time. really big capacitors? I would prefer not to use a microcontroller but it might be the easiest route to go. also, any way to use electronic inductance to generate some energy- stealing energy from objects ? Investigations of Hertzian space. continuation of work done in Project Development Studio. In the end wound up producing Electronic Copy (Infrared Detector Cloud) with the great Rory Nugent. Interestingly, everyone immediately tried to use their cellphones on Electronic Copy (Infrared Detector Cloud). Once people heard infrared, they also would try using their body heat, thinking infrared means heat. had wanted to use just a single candle in the center, but this didn't work for a few reasons: 1) it needs to be very very dark. ambient infrared from incandescent bulbs is enough to light up the circuits, so the contrast of the candle isn't enough. an infrared filter cuts down the light from the candle even further. 2) the flickering from the candle isn't very noticeable, so there isn't that movement which makes the effect exciting. I would love to do this however so I want to keep trying things. In Live Image Processing, produced a performance using telephone pickups from Radioshack. Called this Statik. The pickup allows EM to be converted into sound. You get a very exciting signature noise to each electronic device, even every part of an electronic device (e.g. laptop's harddrive vs. screen, etc.). I have tried an amplified magnetic pickup from Red Lion, but the cheap telephone pickup from Radioshack turned out to work better. Unless I'm not using it right. Need to investigate this. Also experimented with cellphone flashing charms... this seems like a great way to detect phones. Was used to great effect in cellphone disco. There should be a way to make the output vibration instead of flashing, so I was thinking of creating a wearable device to detect cellphone use.